She knew what he wrote . . . One little word that made her feel both cheated and beloved. 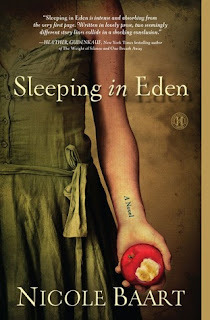 I found SLEEPING IN EDEN to be quite the interesting book. Not written in a style or even in a genre that I usually red, I spent the first quarter of the book trying to figure out just how Meg and Lucas were connected. And then I spent the remainder of the book totally entranced. Meg was a character that I found the easiest to relate too especially as the author, Ms Baart, could have been writing about me when I was younger though my triangle occurred after high school. Lucas was harder for me though I very much enjoyed watching him grow and learn that you can't fix everything. I was especially amazed when I found out that SLEEPING IN EDEN was actually the first book that Ms. Baart had written even though it is just now being published. I will definitely be adding her books to my pile of books to read, especially when I need a reality check from all the fantasy that is my usual diet. I rate this book a 3.7 and recommend it to any of my readers who enjoy a good a mystery which goes much deeper then the usual whodunnit.